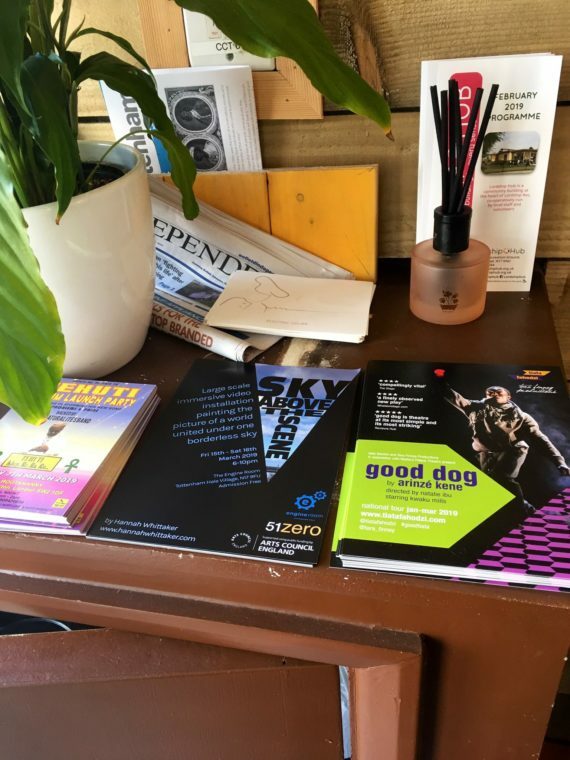 This blog is written by the participants of the Sky Above the Scene project's mentorship programme. I would like to introduce Olivia Pittas and Darnell Carol-Walters, who will be participating in the Sky Above the Scene mentorship programme throughout March 2019. The mentorship is an applied, paid apprenticeship, working on the project as best fits their interests, such as curation, production, event planning, marketing, workshop leading, photography/filming. 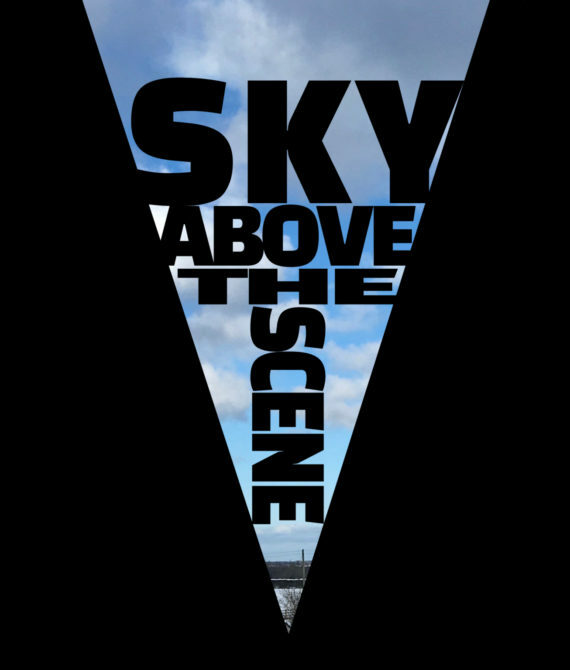 Sky Above the Scene is a project that paints the picture of a world united under one borderless sky. In a time of borders being strengthened and unions being separated, this project aims to focus attention on what unites us – appreciating our coexistence under one, borderless sky. While this may be a seemingly obvious fact, it’s by providing a space to meditate on it that allows this to change how people perceive the world. Challenging and calling into question our perceptions of other cultures being far removed and “foreign”, while also celebrating diversity and making us think about how our own community is viewed and how we would like it to be perceived. These last two days have been the most eventful by far, as we finally set up the plinths for the exhibition, the posters and flyers, and the review system for the audience’s experience, among a few other things. I played my part in the production side, acting on the risk assessment I’d wrote by taping down the seven projector plug cords with white duck tape, reducing the possibility of the audience being tripped over, as it cannot move and the tape is easy to see in the dark. I took responsibility in learning how to set up the haze machine by reading its manual on Friday the 15th, before having it set up on Saturday. The purpose of the haze later came to light, surprising us all, including Hannah herself. The effect really brought the experience to life. I tried to maintain the conditions in the hall by having a fair amount of haze and keeping the entrance closed as often as possible, while the machine produced the gas intermittently. We later realised that it was getting too the cloudy inside, so cloudy we could faintly taste it, and turned it off – a lesson for another day. I had to problem solve with the team, when attempting to drape over the distracting features of the room, by contributing my ideas to everyone else’s. I even made attempts to get more viewers for the exhibition by giving out flyers to those in the area, which was new and nerve-racking, as randomly talking to strangers on the street has never been my strong suit. All in all, this has been the most enjoyable and learning experience, as I’ve; put my D&T knowledge into practice, seeing its importance and effectiveness in real life situations first hand, improved my attitude and effectiveness in teams, learned how to operate a haze machine, a lesson I could later apply to my future (art) projects, and improved my confidence by pushing out of my comfort zone. The last week in preparation for the Sky Above exhibition required me to help advertise it, therefore I handed out flyers throughout my university, as well as announcing it in a morning lecture. I also gave out flyers within the area, especially to the students living in student accommodation. I also posted details of the exhibition on Instagram. I also had to create the feedback board, where I gathered information from the audience such as; How old they are, how they heard of the exhibition, and what their experience was. I then followed this up by filming some of the audience members and asking them what their experience of the exhibition was, and what they believed was the message. Throughout the show I also took various pictures capturing people’s reaction and experiences. Personally, I believe I may have experienced the exhibition slightly differently to audience members, as I was more keen on observing the audience , and their response to the art. But I also got to enjoy the final outcome which we had been planning, and it was a great experience to see Hannah’s vision come to life, having it all set up, and having other people interacting with it. 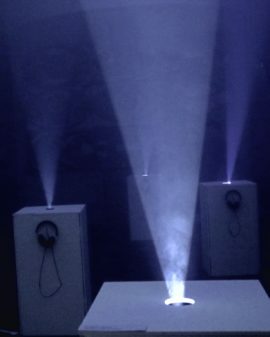 I must say that the second day of the show was definitely a better experience and outcome, as Hannah was able to adjust the sound from her recordings, as well as create a smoky room which enabled us to see the projection beam linking to the sky above. Overall, I’ve learnt that creating a show/ exhibition requires a lot planning. A lot of attention to detail, and also a lot of testing. It was also very interesting recording audience’s responses as they had different perspectives of the art which I had not thought of myself. Curation of space, in which we have discussed how to display the work. Info board, where the information for the audience will be displayed and in what format. Feedback area, which will only be done on the days of the exhibition, as I will be filming the audience’s experience and asking a few questions. Audience experience, where we discussed how to give the audience the best experience of the exhibition possible. Things such as handing out posters in order to gain more awareness of the exhibition. During this project, I have specifically learnt that there a lot more technicalities that go into exhibitions. A lot more planning, and a lot more organisation that I had previously not given credit to. I have also gained a lot more knowledge of how to shift my ideas into reality. In the beginning of the session, our roles for the exhibition were clearly reiterated to ensure that we understood and were satisfied. My role is within the production side of the exhibition, mapping the space, dressing necessary areas, and writing up risk assessments for the use of the plinths within the exhibition. One of the tasks assigned to me on the day, was to write up a risk assessment for the use of the plinths. This was fairly easy for me as I have already come across risk assessments in D&T. 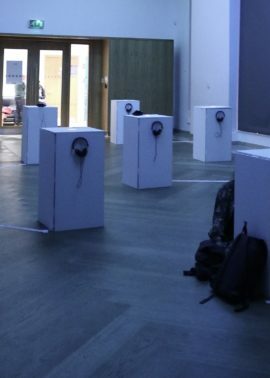 The next task was to take note off any important features of the exhibition hall, that have to be considered for the final opening, such as available power outlets and their positions. I was rather surprised by the amount of risks posed by the plinths, that were so basic in appearance. 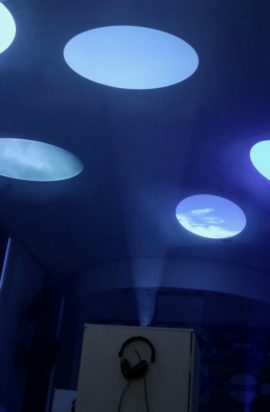 There were a few things that I hadn’t thought to consider, such as the use of the projectors, the potential for them to overheat, and the precautions that had already been placed for that risk. This experience highlighted how even the simplest of things could this pose a threat, and how my mind is prone to over-complicating such things, which, like then, causes me to miss these things. 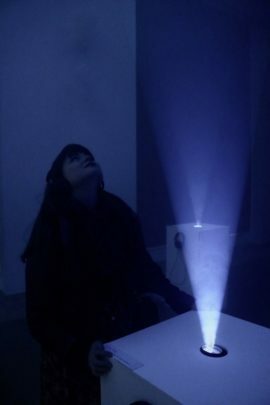 My name is Olivia Pittas; I am a 19 year old artist studying Theatre & Screen at Camberwell college of Arts. Next year I will be studying PDP (Performance, Design, & Practice) at Central Saint Martins, where I hope I will be able to grow as an artist, and learn invaluable lifelong skills. My interests within Art have recently become geared towards manipulating surroundings, through screen, photography, performance, and installations. I am currently working on a self-directed project titled ‘Routines’, where I will explore how to create an immersive and enjoyable outcome for both myself and my audience. I believe I work at my best when using mixed Medias, such as photography, painting, and film. I also enjoy working collaboratively, as this enables me to draw inspiration from my peers, as well as learning new styles and techniques. I was immediately drawn to the ‘Sky Above’ project as it offered me the opportunity to collaborate with an experienced artist who has a set idea in mind, and is working towards a goal. Hannah’s project also seemed very fun, even from the advertisement, before meeting Hannah, I could tell that this was going to be something that I would want to work on. 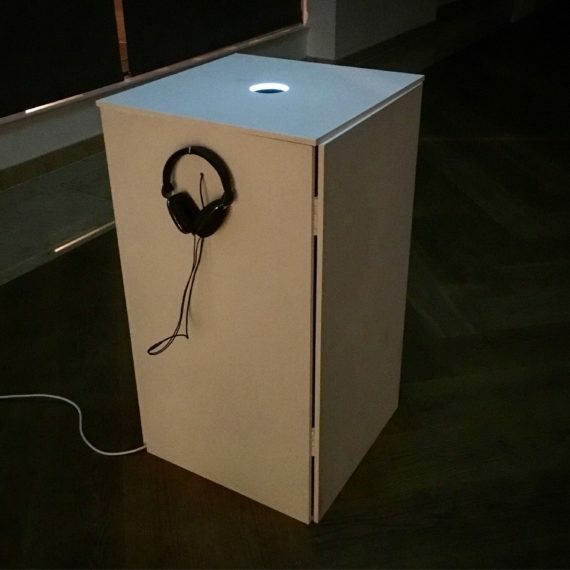 This is a unique experience, and I am confident that I will learn vital skills such as how to bring an idea to life, curating an exhibition, and developing communication skills. I hope that from this project I will learn how to develop my own ideas into a reality, as well as boosting my confidence within the art world through the new set of skills and information learnt on the project.